I am so excited to be part of the Danberry Design blog and my hope is that anyone who reads this will be inspired to step out of their comfort zone and get creative with their trash-to-treasure finds. We have all heard the saying, “one person’s trash is another person’s treasure.” Mine is usually a piece of furniture that I have either been gifted, found at a second hand shop, or bought at an auction or flea market. So what type of furniture pieces are on my list when I am searching? Personally, I like to look for small pieces of furniture: end tables, sofa tables, chairs, and, ocassionally, outdoor furniture. One of my favorite ways to find furniture is at auctions. I love the energy and I’m always intrigued by the nuances of the auctioneer. Auctions aren’t the only place I shop, though. Second hand shops, flea markets, yard/estate sales, and even the internet (yes the internet: Facebook Marketplace, Craigslist, and Ebay) are places where one can find great items. I always tell people to enjoy the hunt and don’t be so focused on finding a piece that looks a certain way. 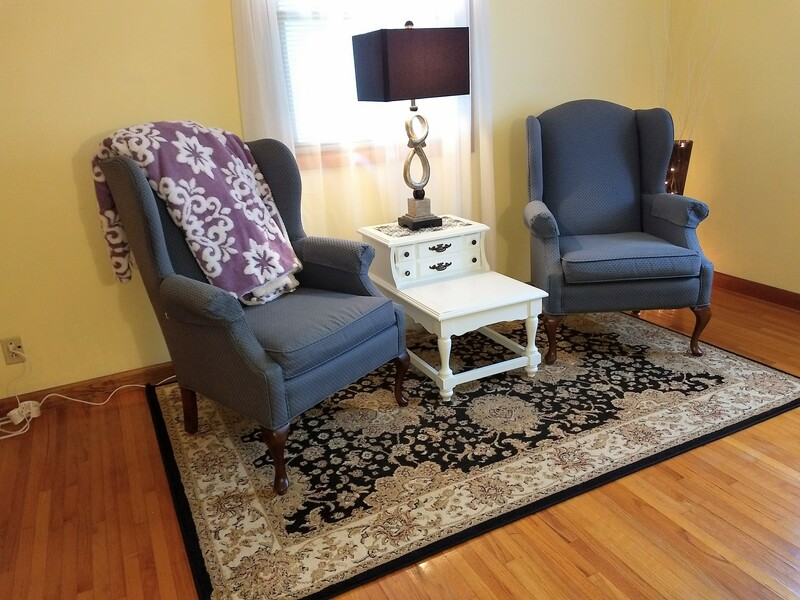 Keep it simple and be open-minded when looking for furniture to refinish. I have ground rules that I always stick to during these projects. First, I set a budget on how much I want to initially spend. Second, I consider my vision for the piece. And third, I decide on a supply budget. That’s it! Three rules! I find it best to keep the ground rules simple when refinishing furniture, otherwise I will stress over every detail. The purpose is to channel creativity- not stress! Rule number three: supply budget. This can consist of numerous supplies depending on how in-depth one wants to get with a refinishing project. The basics are usually sufficient and consist of paint brushes, paint rollers, sandpaper, paint tray, and paint/stain. 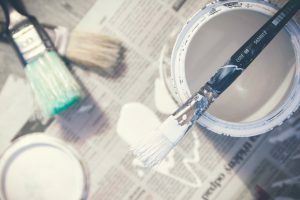 With the exception of paint, stain, and sandpaper, most supplies can be cleaned up and used for more than one project. Usually a quart of paint/stain can last through two small projects and properly cleaned brushes can last through many. 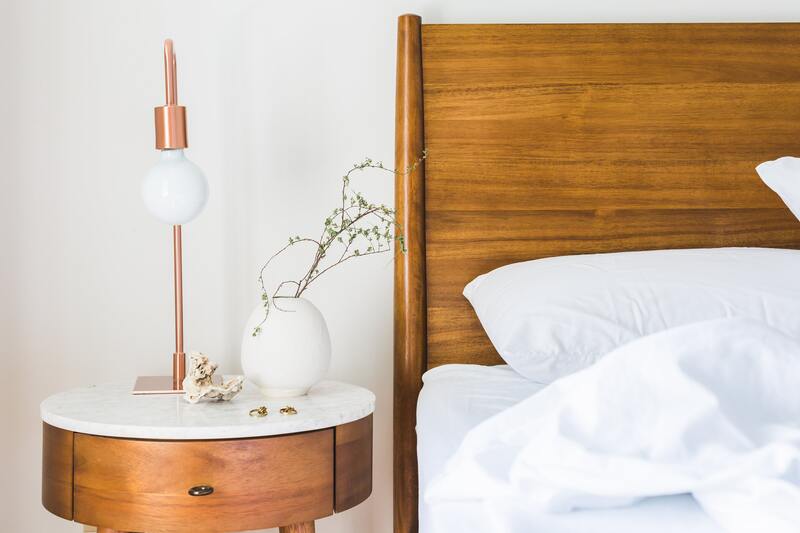 It goes without saying that many of us have scrolled through Pinterest and noticed an amazing piece of DIY furniture. It started out as one thing and was given a fresh look, then used for something completely different. One of my favorite examples of this comes from my friend, Lindy Donaldson, who was given an old bookcase that she turned in to a beautiful piece for her foyer. 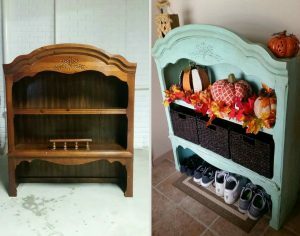 For this revamped bookcase, Lindy used chalk paint in a teal color. Now the piece is a designated place for guests to set their shoes and belongings. Plus, Lindy is able to add her own decorative touch with the change of seasons. 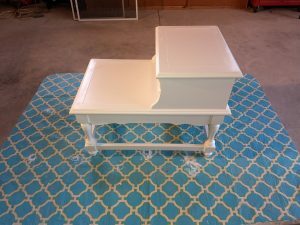 I’ll admit, I was intimidated with what I saw fellow bloggers doing when I first started to refinish furniture. There are some extremely creative people who can turn ordinary items into a beautiful work of art. But most people (myself included), find such a task to be daunting. 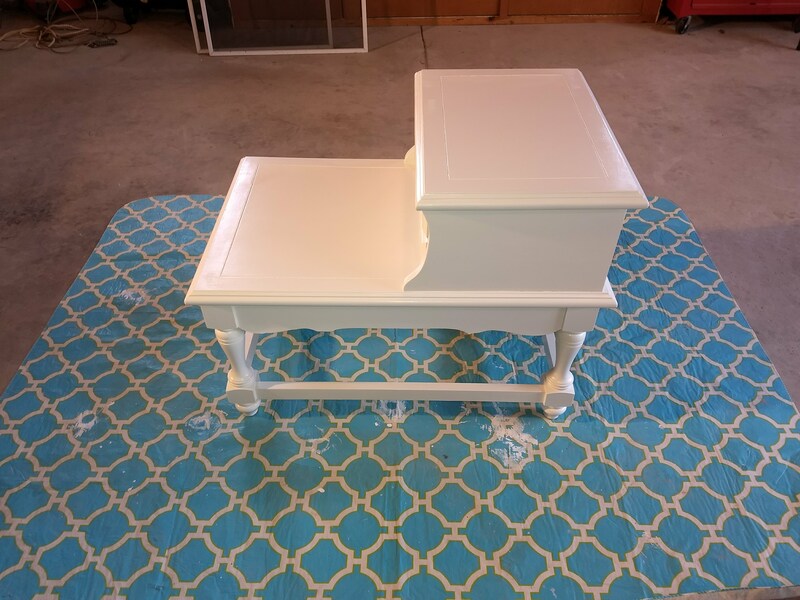 My advice is to start out small with a refinishing project. It could be as simple as doing nothing to the piece visually, but using it in a different manner, like utilizing a storage chest as a television stand. Remember, there are many creative ideas out there, but I suggest that the piece of furniture has a functional purpose within the home. I’m often told by friends, “my furniture is very sturdy and fits perfectly in my room, but I need a change.” Usually I recommend they give the hard pieces of furniture a fresh new look with some paint. 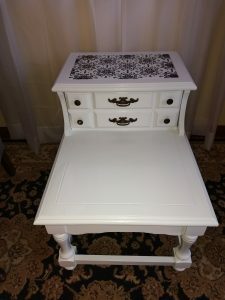 With the example of my pictured end table, I found that at a second hand store and it was in rough shape, to put it mildly. But it was sturdy! I began by sanding the stain finish off and cleaning it up with a damp cloth. I knew I wanted to do some kind of stencil work and give it a simple black and white finish. So I continued by priming the end table so that any flaws in the wood would not bleed through the paint. Once the primer dried, I used four coats of white semi-gloss paint, then I utilized a wall stencil to paint a black rosette design on the top. From there, I put the original hardware back on and now it sits in my home office. A couple things that I learned from this refinishing project 1.) When using a plastic stencil, make sure to read the directions and use spray adhesive to keep the stencil in place while painting. It will also keep paint from smudging. Rookie mistake, I know, but live and learn, I guess! 2.) Use a small paint roller with stencil designs. This will allow a more even distribution of the paint. 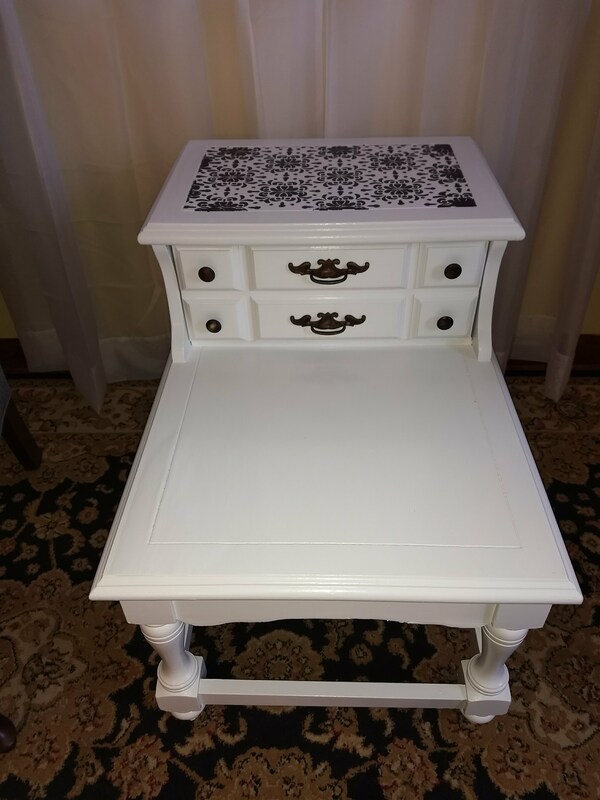 Despite not following the directions on the stencil package, I think the end table turned out well and I love that it is unique to my home. So there you have it! 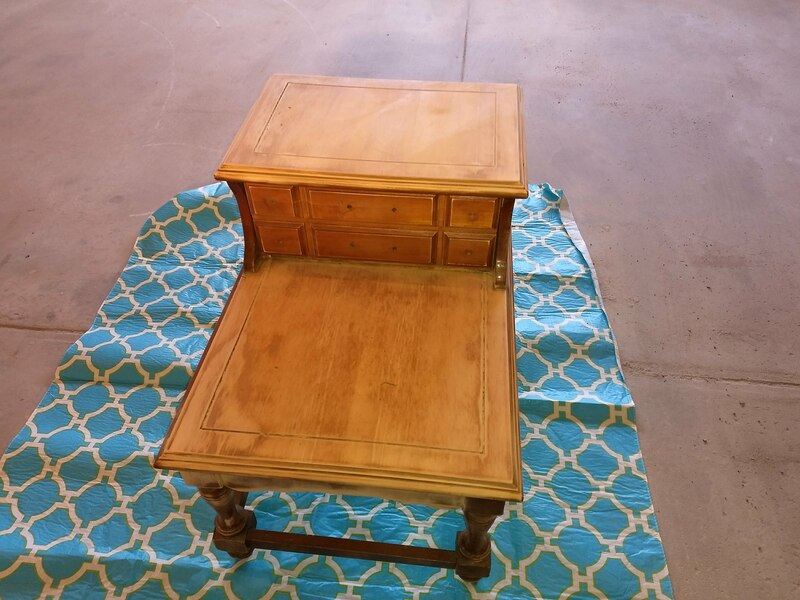 The basics to breathing new life into a piece of furniture by refinishing it! I truly hope you have the inspiration to get creative in your home and find your own unique trash-to-treasure piece! Rickie graduated from BGSU with a Bachelor's in Interior Design. To expand her knowledge on the housing industry, Rickie obtained her real estate license. She loves helping people turn their house into a home!